Food waste is the single largest component of disposed U.S. municipal solid waste. In fact, 40% of food generated in the United States is wasted. One place where consumers are not always sure how to handle their uneaten food is in restaurants. 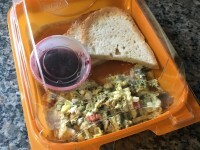 We know the best case is to bring along your own reusable containers for any leftovers, but sometimes that isn’t possible or you may not have been able to plan ahead. Fortunately, many restaurants are now seeking environmentally preferred choices to replace Styrofoam. We recently discovered take-home containers made from PET bottles. These to-go containers are called “The BottleBox” because they are made from post-consumer recycled PET plastic. And best yet, this particular takeout container can be recycled again and again. Other “greener” options for to-go foods are made from plant fiber or pressed paper and can be composted or are made from coated Kraft paper. So be sure to ask for a recyclable or compostable container the next time you want to rescue some leftovers; or better yet, remember to bring a container from home!